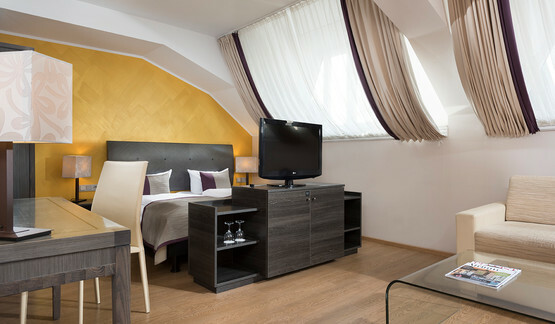 The 109 exclusive rooms including 18 junior suites of the Wyndham Hotel Garden Duisburger Hof are ideal to feel home. Our Duisburg Hotel invites guests to a special kind of experience in a hotel that was built in the golden 1920s and kept is charm from those days: the exclusive Wyndham Duisburger Hof Hotel. 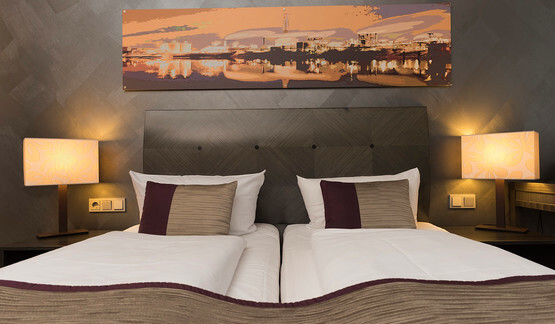 Offering four different hotel room categories, guests of this central Hotel in Duisburg may enjoy excellent service in a historical setting. Besides the rooms which are located to the quiet backyard, we can also enjoy the view on the theater of Duisburg from some rooms. The Superior and Deluxe rooms as well as the luxurious Junior Suites at our hotel were renovated in 2012. They shine in modern and friendly design and offer high comfort for our guests. 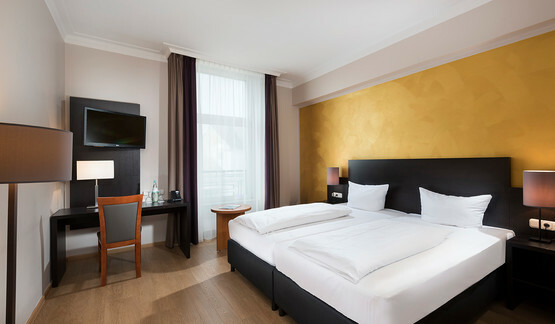 The cosy standard rooms of Wyndham Duisburger Hof Hotel offer high comfort in an exclusive environment. The rooms are spacious and all beds are equipped with high-quality mattresses for your comfort. Our traditional standard rooms offer a bathroom with shower or bathtub, as well as a flat screen TV. The working desk and free Wifi are perfect to work on your laptop during a business trip to Duisburg. Our superior rooms were renovated in 2012 and offer a lot of space to relax. The comfortable rooms are equipped with high-quality and modern furniture, so you will not miss anything during your holiday in Duisburg. The bright and colorful design makes the rooms shine in fresh and friendly splendor. The spacious rooms offer double or twin bed, bathroom with shower, as well as a working desk, free Wifi and flat screen TV. Our deluxe rooms were also renovated in 2012. They offer high-quality and modern equipment as well as allergy friendly laminate floor. Because of the friendly color scheme in the bright rooms, you feel like home. A high-quality double or twin bed will take care of a restful sleep. Besides the equipment and service of the superior category the coffee and tea station is entirely yours during your stay in the deluxe rooms in Duisburg. 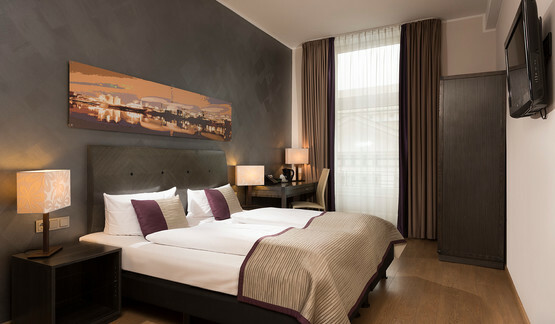 The luxurious Junior Suites of our hotel in Duisburg offer stylish atmosphere with a lot of space to feel comfortable. Big windows of the Junior Suites of the Wyndham Duisburger Hof Hotel bring a lot of daylight into the rooms. The allergy friendly laminate floors and the friendly color scheme create a comfortable atmosphere. A separate living area as well as a walk-in closet offer quality corresponding to our 4-star-hotel. A high-quality double or twin bed will take care of your restful sleep. Exactly as in the deluxe and superior rooms you will enjoy high-quality equipment, which will not leave any desire unfulfilled.